Alas, poor bandits – we knew them but briefly. 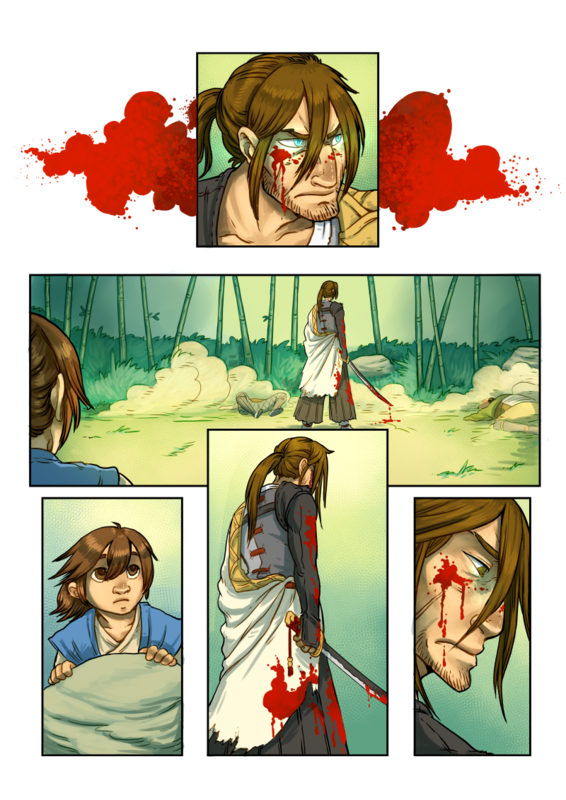 They should have known better than to pick a fight with the grumpiest samurai in existence. Their only comfort is that Masahiro is, at least, not gloating over their deaths*. That first panel up there is one of my favourite bits of this chapter. It came out exactly the way I wanted it to. *) Or their apparent deaths, anyway. I think I love them too much to kill them off permanently, though their adventures will have to continue off the stage for now – I want to return to their shenanigans at some point, but this is their last scheduled appearance in the main storyline. …Akane looks WAY too trusting. So I wonder what she’s seen. I guess I’m a few years too late, but I’d like them to be called “The Shenanigang” – but since it’s been three years since the comic was posted, “Shenanigang” is probably the name of a band now. Stupid passage of time ruins everything. There's a Patreon-exclusive sketchcomic about their future adventures after this particular encounter, but now I kinda want to draw more about them.